Prevention and Control Category: KISC Target Species. OISC Target Species. MoMISC EDRR Species. MISC Target Species. 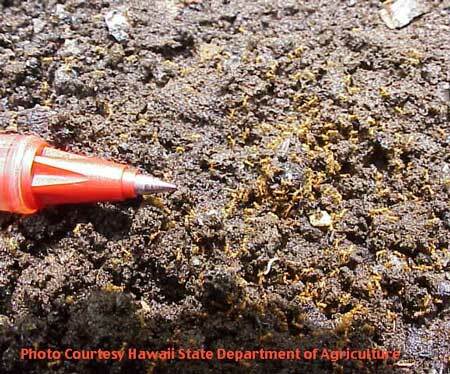 Since the discovery of Wasmannia auropunctata on the Big Island in 1999, the Hawaii Department of Agriculture has enacted quarantine regulations to prevent the shipment of potted plants infested with little fire ant from the Big Island to other islands. Additionally, the Hawaii Ant Lab (HAL) was established to address invasive ant species in Hawaii including little fire ants (LFA). Located in Hilo, HAL has developed innovative LFA control methods and works statewide to assist in management. This ant is a uniform yellow-red to light brown in color, all workers are 1.5 mm in length (half the size of a sesame seed, or as long as a penny is thick, about 1/16”). Little fire ant does NOT build mounded dirt nests, and nests in a variety of habitats including in trees, around potted plants, irrigation lines, and in electrical boxes. They are slow-moving and easily dislodged from leaves, plants, and trees. They often sting on neck, arms, and torso (LFA infestations are often discovered when ants fall on people from above). Delivers a painful sting when disturbed. Welts can last for weeks. Infests agricultural fields and farms, where they damage crops and sting workers. Promotes plant pests such as aphids, white flies and scale insects, which secrete plant sap that the ants eat. In turn, the ants protect these insects from natural predators and parasites. Can also infest houses, beds, furniture and food. They may sting, and even blind, pets such as cats and dogs. In the Galapagos, eats tortoise hatchlings and attacks the eyes of adult tortoises. Kauaʻi: One infestation known in the Kalihiwai area. Oʻahu: First detected on O’ahu in December 2013 in a shipment of hapu’u logs from Hawai’i Island. Additional infestations have been found in Mililani Mauka (treated), Waimanalo (still under treatment), and most recently, in Kaneohe (December 2018). 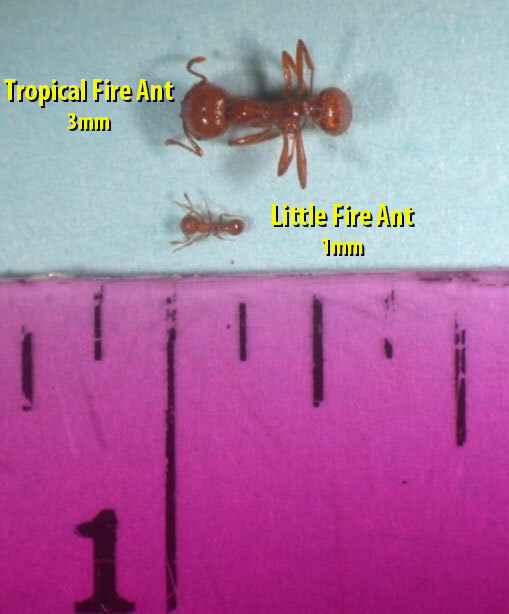 Visit the HDOA website (http://dlnr.hawaii.gov/hisc/info/little-fire-ants-on-oahu-response-updates/) for the latest information. Molokaʻi: Not known to be present at this time. Maui: First found in Waiheʻe in 2009, then in Nāhiku in 2014, and in Huelo and Hāna in 2015. Detected at Kapalua Resort in 2016. All infestations are localized. If you suspect there are LFA anywhere else, please report it! Lanaʻi: Not known to be present at this time. Kahoʻolawe: Not known to be present at this time. Big Island: LFA infestations are widespread throughout the windward side, including in Hilo, the Puna district, and along the Hamākuā Coast, in/around nurseries and properties that purchased plants from infested nurseries. Smaller infestations have been found in the Kona-Kailua area. If you see this species, call 643-PEST and/or visit www.reportapest.org. Survey for ants on your property and test all materials you bring home including, but not limited to,mulch, plants, agricultural products, and construction materials (see below for instructions). Tropical fire ant (Solenopsis geminata): The tropical fire ant is common throughout Hawaii. A microscope is required to tell the difference between the tropical and other fire ants. This small red ant is 3-6 mm (1/8-1/4 in) long, much larger than the little fire ant. Some of the workers will have proportionately large heads. This ant is restricted to dry coastal areas and nests in the soil, but it does not construct mounds. Tropical fire ant stings will cause irritation, but should not cause white pus filled blisters that persist for days.